The most elegant of the medieval instruments, the larger floor harps had a range and versatility that was simply not available in any other instrument. A true polyphonic instrument, with design components that let the player even play accidentals when needed, this was the king of instruments in it's time. Often referred to as a 'Gothic' harp, this had nothing to do with a time period, but instead refers to the resemblance to features of Gothic architecture. Tall points, sweeping curves, narrow angles and a graceful upward movement were all basic components of the visual appeal, and with upwards of 29 strings, the range was amazing for the time. This instrument doesn't sound like a modern folk harp, nor like a modern concert harp. It is a different sound, one lost in the forward march of technology, but still quite endearing and useful in both period and modern soundscapes. The only issue with these floor harps was their volume. 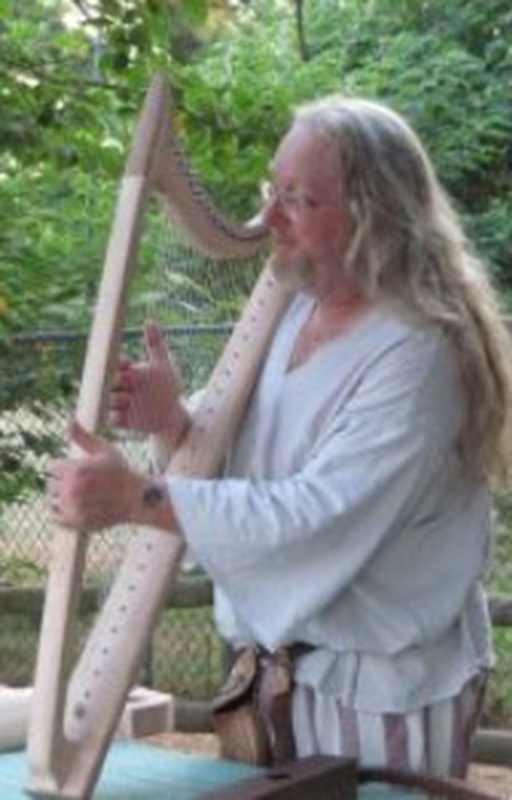 Because technology had not yet been developed to build a high-tension frame similar to today's concert harps, the medieval floor harp was built light and string and compact to help overcome the challenges of the string tension 20+ strings would put on an instrument 3 feet tall or taller. These smaller soundboxes, carved from a single piece of wood like many other instruments of the time, had beautiful tonal qualities, but due to lack of soundboard area, did not project with the authority of modern large harps. This made the floor harp perfect for chamber and intimate settings, but to perform for a larger audience, the player needed a bit more, especially in the lower range of notes. Thus the bray pin came to be. This device replaced the regular soundboard pin on the harp. A small flag-like protrusion to the side was adjusted to make contact with the string only when it was vibrating, taking more string energy and adding it to the energy already being focused on the soundboard at the point the string exited the body. This was a mechanical amplifier, and works extremely well. But the sound is changed, resembling more the chein on a hurdy-gurdy or the buzz of a sitar. This was a raspy sound, said to resemble the braying of a donkey, and thus the name bray pin. And those harps on which this pin were fitted became known as bray harps. The best part of this invention - you could turn on the brays on the stings you needed, or turn them off completely, without needing to re-tune the instrument. A functional and useful mechanical amplifier and effects box with a fairly easy to operate on-off switch. We base our instruments on archaeological evidence, historical art and written documentation, but we do not replicate these instruments. Instead, we choose to take what we know from these sources and our own experience, mix in the imagination of the customer, occasionally add in a drop of technological magic, and create what a harp builder of this era would have created, a unique piece for his client. So drop us a message or give us a call. We promise, we won't charge to answer your questions. This is the smallest of the floor harp, playable also as a large bardic or travelling harp. Nineteen to Twenty-Three strings in a compact frame, while playing seated this instrument's foot would have commonly rested on a stool or stand. When fitted with bray pins this harp could project to medium halls or smaller outdoor gatherings. It is easy to transport, maintains tune well, and is robust and attractive. Several design options are available. Like it's smaller sibling, this instrument is still relatively easy to transport. The extra tension provided by the addition of up to 6 more strings meant that this harp was a bit more susceptible to mechanical failure caused by knocks and bumps, and so it became primarily a stationary harp. It was large enough to be played while seated comfortably without needing a floor stand, and it was more powerful as an instrument because of it's increased soundboard size. Most commonly bearing 26 strings, only a few were built with more, as 29 strings was reaching a mechanical limit for the way the harp could bear load. It was not until the development of the double-strung harp, which allowed more load to be carried on a smaller and stouter arch, that the 29 string Gothic harp was surpassed, and not until the development of the first modern reinforced concert harps that it was eclipsed by a single-strung harp.